How cute is this little ring 🙂 I love it! It has little crystals and two gold-tone spikes. Also it’s not a single ring, it’s a set of two small rings, that you can wear separately, or together. I got this ring on sale for only $7! If you are wondering about my nails, they re short again and I don’t know whether to be happy or sad about it… Anyways, they’ll grow back again soon. And yes, I have a new nailpolish from Sally Hansen Salon Manicure. This beautiful dark burgundy/purple, almost black color, is called ‘Pat on the Black 660’. I think it’s very similar to Essie’s ‘Wicked’. What do you guys think? Okay, let me just say that I NEVER buy the same things in different colors, except for basic tees (you can’t have too many of those, right), but the moment I saw these beauties, I knew I was going to get more than one pair! 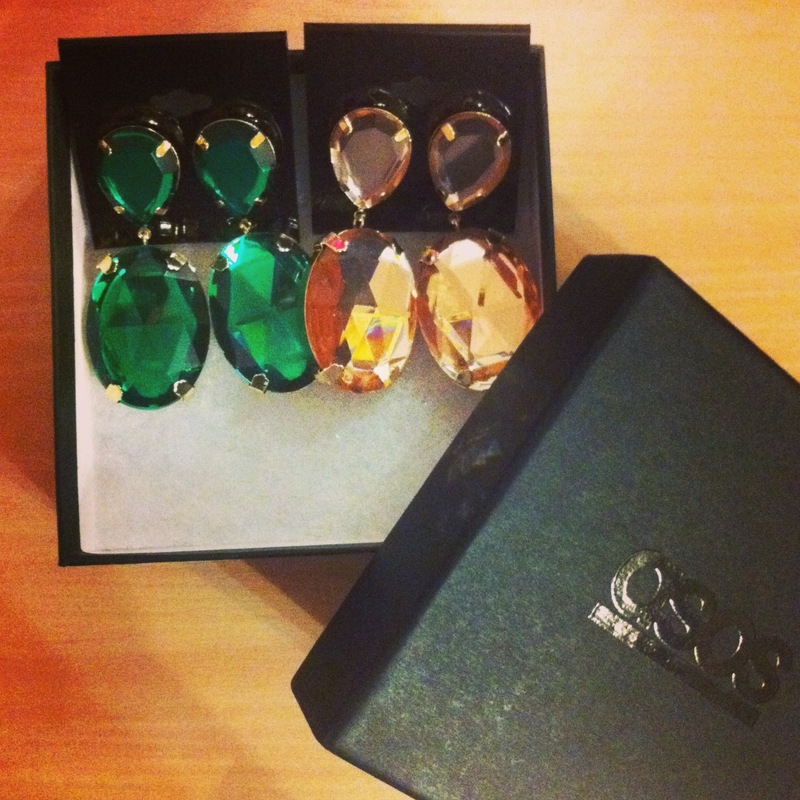 Asos offers them in green, champagne, white, coral, blue (remind me a lot of Anna Dello Russo’s collection for H&M) and clear ones. And they are all gorgeus!!!! As you can see I got them in green and champagne, because I think the green ones will accentuate my green eyes, and the champagne wil look cute on anyone with warm skin tone. I must say that white, coral and blue ones will look fabulous on girls with deeper skintones. As for the earings with clear stones, they are not exactly clear, as they have blue, green and pink undertones to them. Very pretty! As always the quality and design of Asos jewellery is amazing! I got each pair for $14.